Pope Francis can make a difference in Mexico by addressing Ayotzinapa. 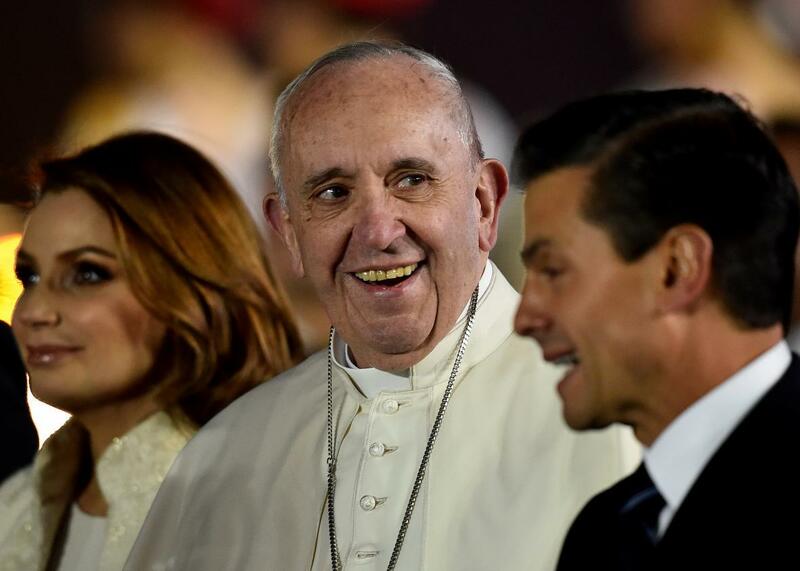 Pope Francis smiles next to Mexican President Enrique Pena Nieto and First Lady Angelica Rivera upon his arrival in Mexico City on February 12, 2016. Pope Francis arrived late Friday in Mexico, home to the largest Spanish-speaking Catholic population and the second-largest Catholic population in the world. The country will spend $8.6 million on his visit, and more than 882,000 tickets to pope-related events have been sold. People across the country have been eagerly preparing for his visit for months, particularly activists who hope he will speak on the issues he holds dear and that greatly preoccupy Mexico. Pope Francis has positioned himself as the pope of the poor, of the marginalized, of immigrants, particularly of immigrants from Latin America in the U.S., most of whom are Mexican. His trip to Mexico will include a visit to a prison and a slum; the mass he leads will be translated into three indigenous languages; he will wear traditional clothes woven by indigenous groups. These will all be powerful symbolic gestures, I’m sure. But no matter how well intentioned, Pope Francis’s visit is unlikely to make a dent in the tragic, unmitigated disaster that is Mexico today. The Vatican itself has acknowledged that the pope is not going to Mexico to fix its problems. But if he wants to make a difference in the causes he champions, in a country he says holds a special place in his heart, speaking out on one particular issue could in fact provoke lasting social change: the disappearance of the 43 students from Ayotzinapa. The government’s official version of the disappearance, though it has been widely and publically discredited, is this: On the night of Sept. 26, 2014, the mayor of the nearby town of Iguala and his wife ordered local police to capture a group of students from a teachers’ college in Ayotzinapa, in the state of Guerrero, who were traveling to Iguala to raise funds and protest recent school reforms. Local police then turned them in to a local drug gang, who then killed and burned the students in a nearby dumpster. Three gang members were arrested and even confessed to the gruesome crime. But the story didn’t add up. The students’ parents, activist groups, human rights groups, and ordinary Mexicans began to demand that the students’ bodies be found and those responsible be apprehended. The federal government, including president Peña Nieto and then attorney general Jesús Murillo Karam, delayed their response, and when they reluctantly faced the students’ parents and the press, they were dismissive, even rude, inspiring more protests and social media outrage. After increased pressure, the administration finally agreed to allow a team of foreign forensic experts to lead an independent investigation. The team concluded what most in Mexico suspected, and what scientists at the National Autonomous University of Mexico, and independent media investigations, have repeatedly said before and since: That the government’s version of events is scientifically impossible. Even though thousands of official documents and video from that night show evidence of direct federal police and military involvement, to this day no arrests have been made at the federal level. Mexico’s problems are terrifyingly complex, but they all swirl around drug trafficking, violence, corruption, and impunity. And no other issue better exemplifies this mess of problems, this collusion between the cartels, local drug gangs, and local and federal authorities, as Ayotzinapa does. Though violence has decreased in the last three years, since 2006, when former president Felipe Calderón declared his war on drugs lords, at least 138,000 people have died. There are currently nine major cartels present in practically all of Mexican territory. They have infiltrated city-level governments and prisons. This narcoviolence in turn drives street-level gang violence, draining the state of resources that are funneled into a failed drug war and an overpopulated prison industrial complex that rivals that of the U.S. Such colossal levels of violence, and a multilayered narcotrafficking industry that could be its own parallel state, can only be possible when the government colludes with the criminals. A study by the Center of Justice and Impunity at the Puebla University of the Americas in Mexico concluded that 99 percent of crimes in Mexico go unpunished. And then there is the tragic state of the press. Mexico has the third highest number of journalist killings in the world: 23 have been murdered in the past 13 years. Just this week, the body of a journalist from Veracruz was found hanging from a tree. It is this climate of fear and impunity that has allowed Ayotzinapa, a gruesome crime where unequivocally incriminating evidence is widely available, to go unpunished. The pope has spoken out against narcotrafficking, violence, corruption, and crime—but appealing to drug lords or corrupt politicians seems unlikely to be effective. He should instead make a direct call for people, particularly young people, “to keep up your struggle,” as he said to grassroots activist groups in Bolivia, to hold politicians accountable for enabling the current murderous status quo. It’s in this demographic where he can have a bigger impact. Ciudad Juárez, where the pope’s tour ends, is perhaps the most politicized city in the country…. The violence from the Drug War triggered the creation of dozens of organizations that denounced the complicity of the armed forces and Federal Police with organized crime. It’s in [Ciudad Juarez] that Francis’s social causes come together: immigration, marginalized populations, labor exploitation, femicide…. Meaning, Francis will close his trip with a political message that will, most likely, make Peña Nieto’s administration very uncomfortable. I hope that message includes a direct reference to Ayotzinapa.